Well what can I say about ‘X’ and crochet? There aren’t many ‘x’ words to start with, I mean you might allow your crochet hooks to be misused in order to play a xylophone, or perhaps the person who interrupted your counting may need an x-ray to determine exactly where you inserted your crochet hook. Because it’s such a tricky letter I did a spot of cheating and found two things that have an ‘x’ sound in them. Picture the scene, you’re about to embark on a rather large and intricate blanket. You’ve made the foundation chain to the correct number of multiples plus turning chain and you’re working that first slightly awkward row into the chains. You reach the end and discover that there’s an extra stitch. Where the heck did that come from? What is it doing there? You check along every repeat of the pattern, counting and checking and you.just can’t work it out. You sit there for a minute contemplating, then you decide it’s just no good, you’ve counted 3 times and it’s still a mystery so you frog it. After all, it’s only the first row. Frustration sets in when it happens a second time as you’d planned to crochet the first 6 inches of the blanket that night and instead you have a headache and a nest of slightly curly yarn. Anyway, you persevere, add a marker every 10 stitches to make sure and manage to get on, but the love for your shiny brand new project is a little bit tarnished. Extra stitches sometimes happen when working in rows too, as in some patterns you need to work into the first stitch (at the base of the tuning chain) and sometimes you skip it. It all depends on the pattern! Working in the round also comes with this hazard, especially on intricate patterns like Sophie’s Garden where the stitch count really matters. If you aren’t sure how many stitches you have then I find it easier to count backwards from the final stitch in the round to determine which stitch to start in. I’m still undecided as to whether it’s better to end up with too many or too few stitches. There’s always a huge sigh of relief when the stitch count is spot on! This is inspired by another blogger who commented on one of my other A-Z posts. When you’ve been crocheting for ages it’s easy to get stiff hands and arms. There’s a tonne of exercises out there and, in the name of science, I’ve tested a few. 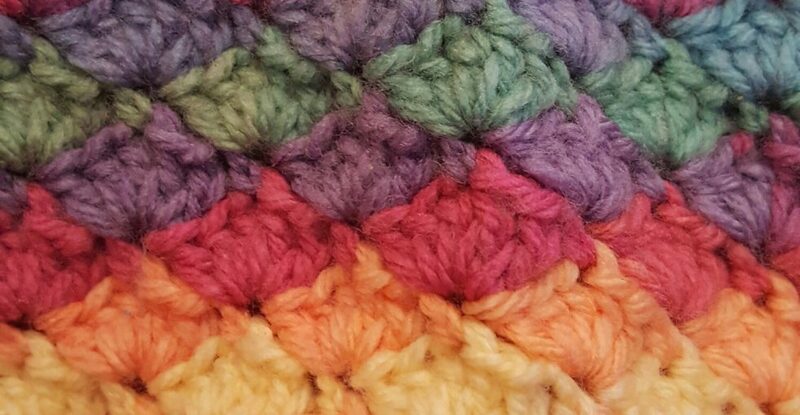 The Craftsy blog has a few suggestions, though it’s worth looking on YouTube for videos too as sometimes written instructions can be harder to follow. I’ve found its good to stop every half hour or so and just spend a minute or two stretching out and loosening muscles. Otherwise it’s a long time for my hands to be repeating the same tiny movements, especially my left hand which holds the work and tensions the yarn. What is your favourite crochet exercise? Do you have any tips for avoiding extra stitches? After hurting my wrist when working on that second blanket I should really look into those exercises lol. I think I would rather and extra stitch rather than not enough. You can always sew in that extra stitch at the end when you are finished and just ignore it throughout the project. It is easier to ‘absorb’ a stitch if you have to, I agree. Still frustrating though when you thought you’d counted carefully. Definitely! For such an apparently relaxing hobby it certainly has its moments of stress. Splitty yarn makes me cry, especially when you have 1200g of it for a blanket! I can relate, I bought 800g of yarn that I thought was a good deal, until I started crocheting with it, every stitch split! But ironically, I tried knitting with it and had no problems, I guess some yarn is just not crochet yarn!! I may have to rethink my plans then, although I have made 15 squares already. 1 more to make 16 and then turn it into a pram blanket maybe? Perhaps I’ll try knitting with it before I decide. Thanks for the tip! I am in awe of your crocheting skills.. And although I do granny squares quite well, I have never really followed a pattern.. But have bought books to try to enhance my skills.. I am a knitter so shouldn’t have a problem.. Yet seem too hold the hook and wool different, ( like I am knitting) so many this makes it harder..
And I can still split wool sometimes and make an extra stitch 🙂 in knitting..